I know this is a fashion blog, but we all love pretty things, right? 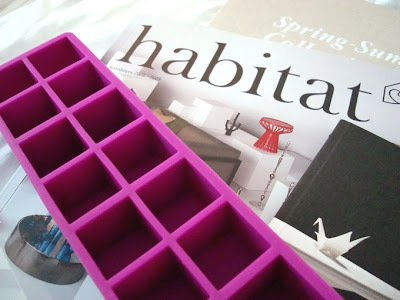 I visited Habitat this Saturday, and even though I loved almost everything in there, I had to restrict myself just to this fuchsia silicone ice cube tray. And some catalogues to take home for the obligatory eye-candy, of course! Am I weird for being excited because it will make ice cubes with perfect cubic shape? And because it's hot pink? is it just me or have the prices in habitat rocketed since it re-opened? Most probably, EVERYTHING is more expensive now than a few years ago. 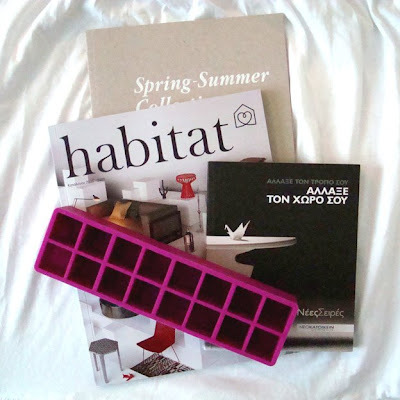 But I really can't tell about Habitat, as I have never visited their store before. Many things where indeed ridiculously overpriced. Lopita, thank ya so much 4 the advice, akolouthisa ti sumvouli sou kata gramma...!!!! den xerw pws na s euxaristisw..!!! An kai mou leipoun photos apo ena post, katafera n apokatastisw ta upoloipa...!!! K epeidi den exa kanei comment se polla posts sou logo genikis apoxis...to P&B forema combined me ta new maloles+perfection!!! hehe love the colour! I thought that it was only me who get excited with little things like that one! And I think that Habitat was always expensive..at least compared to other similar shops! Hah. No, I'd feel the same way. It's a perfect little homey indulgence. oh yes. style and function. αν υπηρχε αστυνομια μοδας,σιγουρα τωρα θα ησουν ισοβια στη φυλακη....μη σου πω και στην ηλεκτρικη καρεκλα. That ice tray is such a beautiful design! And I would be totally excited too lol. i think its the pink colour, love it! teleio icecube indeed!!! habitat has amazing things and here is as expensive as it is in London so the prices dont realy suprise me!!! Love the color of the ice cube tray but any try would give yur perfect ice cubes..